“Ulysses,”James Joyce’s version of the king of Ithaca as ad canvasser Leopold Bloom in his day-long wanderings through Dublin; George Clooney as Odysseus traveling the South back to Holly Hunter, his Penelope in “O Brother, Where Art Thou”; Nobelist Derek Walcott’s re-imagined “Odyssey” in his great poem “Omeros” set on the Caribbean island of St. Lucia; other epic poems retelling Homer’s 2,700-year-old tale by Alfred, Lord Tennyson (“Ulysses”) and Nikos Kazantzakis (“The Odyssey: A Modern Sequel”), the latter ending with Odysseus washed up on the icy shores of Antarctica. Author Huler resisted then became passionately entwined enough with “The Odyssey” to retrace in the western Mediterranean Odysseus’s ten-year homeward journey after the Trojan War to his wife and son in Ithaca. And, yes, Huler has his own Penelope, wife June, and soon-to-be born son, Louie, awaiting his return in North Carolina. A bit of “Odyssey” back story. After the Greek’s victory in the Trojan War, Odysseus leaves for home with his men in 12 ships, condemned to sail the Mediterranean for ten years with adventures, victories, and defeats beginning in Thrace in northeastern Greece, then to Jerba off Tunisia’s coast, to Sicily, Corsica’s Bonifacio, islands near Naples, the Strait of Messina, the Maltese island of Gozo, Corfu, and finally Ithaca. Confusingly, instead of beginning with Odysseus at Thrace, Huler starts the book on Gozo (where the nymph, Calypso, has held the Ithacan king for seven years), his 12th stop following Odyssey’s wake, then come chapters filling us in on the Trojan war and the first books of “The Odyssey” before taking us to his first stop in Thrace. 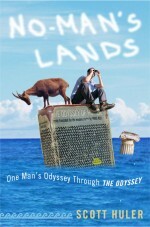 Despite previous versions of Homer’s poem, Huler breaks new ground here: “No-Man’s Lands” is the first “Odyssey” as self-help book and travel guide. After visiting a site of an Odyssean adventure, Huler posits a moral lesson. Example: by rejecting the earthly paradisaical life with Calypso, “Odysseus is choosing reality over fantasy…eventual death over endless life, the troubled reality of human experience over an endless leisure.” Island life with an eternal beauty’s okay but he’d rather work his way home to Penelope and die. Interesting but necessary? The book’s title derives from Odysseus’s famous episode with the giant Cyclops Polyphemus, which occurred in a cave above the present city of Trapani on Sicily’s west coast. The wily Ithacan king tells the cannibalistic giant, who has just eaten several of his men, his name is No-Man. Thus after being blinded in his only eye, Cyclops calls for help shrieking No-Man is killing him. His neighbors draw the obvious conclusion and leave for home. Huber’s a good travel companion, meeting people easily, making his way around the Mediterranean, aboard a fancy cruise ship, through tiny villages where they probably still tell the future by gazing at markings of scraped sheep shoulder blades, on ferries across water clear as thought should be. He always travels with a tiny kite that fits in his pocket which he actually flies on the tiny island of Vulcano, near Stromboli. Travel tip here: if you climb Volcano’s Gran Cratere, don’t sit down since toxic gases collect near the ground.